Training camp is nearly upon us and it is time to see how teams stack up after an offseason filled with changes. The deflategate penalties are finally setting in for the Patriots and the Bills young offense may be primed for improvement, but will it be enough? Jeff Feyerer applies his model of scouting teams to create a 2016 AFC East roster evaluation to determine how the teams shake out in his ratings system. 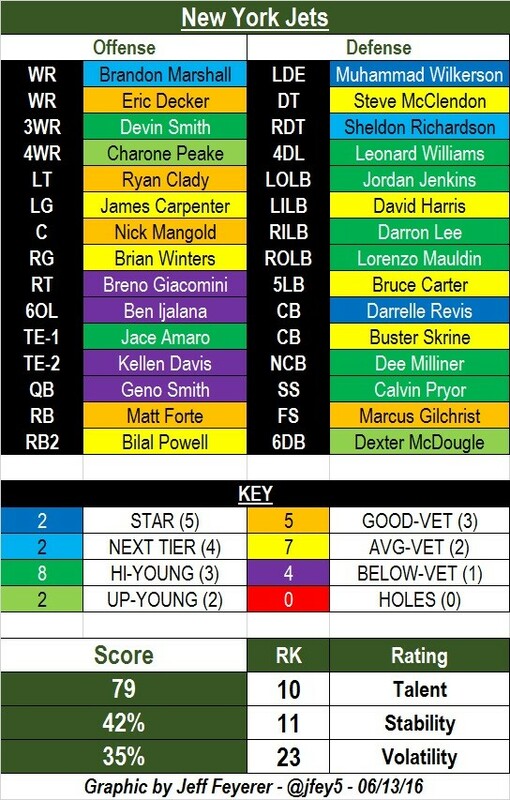 In the coming weeks, I will be rolling out divisional breakdowns based around the rating system I introduced a few weeks ago. 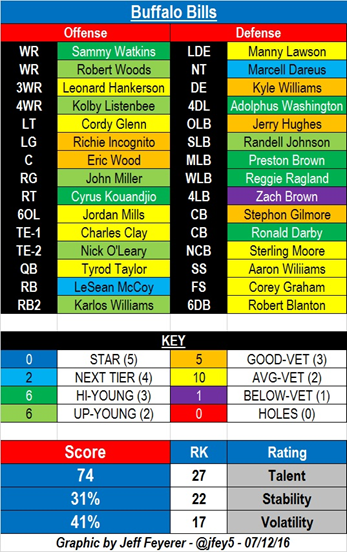 Using each team’s condensed depth chart, as currently constructed and based on my initial projections, I have scored every NFL squad based on the three ratings I set forth: talent, stability, and volatility. A few important points before we jump in. 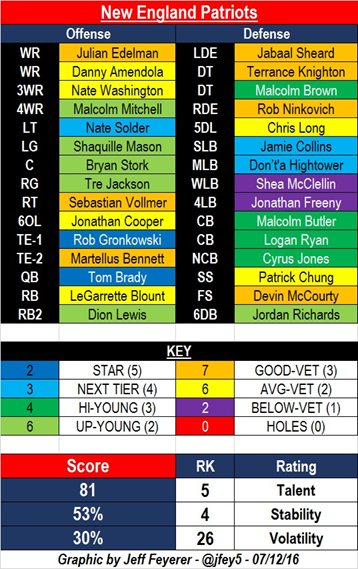 First, this model is a work in progress, and I am refining the model in order to make it an all-encompassing, usable metric for roster evaluation. Second, these ratings are fluid. Following the completion of each division, there will be a league wide projection as each rating is translated into wins based on each team’s three ratings and their schedule. While we don’t have any game action to alter the ratings right now, as the season progresses and more information to aids evaluation comes in, teams will rise and decline, rosters will change, and ultimately these ratings will allow us a real time evaluation of each team’s roster and the league as a whole. For a team rated this low in talent, it’s disappointing for their prospects to have a low volatility score as well. Rex Ryan’s squad had a solid first year under his command, going 8-8 and finishing with a +20 in point differential, but little was done to fortify the roster this offseason. It doesn’t help when the team’s 1st round draft pick, defensive end / outside linebacker Shaq Lawson from Clemson, will be out for months following surgery to repair an injured shoulder. Furthermore, one half of their running back tandem, Karlos Williams, is suspended for the first four games of the season for violating the league’s substance abuse policy. Four young defenders outside of Lawson (Zach Brown, Reggie Ragland, Adolphus Washington, and Ronald Darby) will be counted on to be the future leaders of the Bills defense, but there is currently little in the way of top end veterans thrusting the roster further up the league rankings. I fully expect Sammy Watkins to make the jump this season into the next tier or even star category. He struggled early in his sophomore year with consistency, only to blossom in the last half of the season as he developed a rapport with Tyrod Taylor. Another offseason together for the duo should allow them to thrive for the entire season. While Darby had a spectacular first season and Stephon Gilmore remains a steady option across the field from him, the other four projected top-6 defensive backs all rate as average veterans with little room for internal improvement. The team was 22nd in passing touchdowns allowed and 25th in yards per attempt allowed last season. Corey Graham is better suited as a nickel back and the drafting of a young prospect would have helped. Tyrod Taylor has yet to sign an extension with the team despite a solid 2015 season. The team has little invested in him right now and, given that there is only one year of tape on the fifth-year veteran as a starting quarterback, when balancing all of the factors at work, I graded him out as an average veteran. Taylor’s performance is a key storyline to watch this season, as his profile as a relatively young player finally given his opportunity to shine in conjunction with his chance to operate in the same offensive system with familiar personnel personal and a contract to play for could cause his rating to rise quickly. New head coach Adam Gase is walking into a situation where he’ll have plenty of talent at his disposal. His challenge will be getting that talent to perform. He’ll have Ryan Tannehill, a 27-year-old quarterback, who has played well, and yet leaves something to be desired. In four seasons as the starting quarterback, Tannehill’s raw statistics have been fair relative to others at the position, but being able to lead a team to victories is the barometer by which quarterbacks are measured, fair or not. During Tannehill’s tenure, the Dolphins have yet to reach the playoffs or have a record above .500. His rating here as an average veteran speaks both to that fact and the depth of the position in the league. Gase will also have a stable of young receivers with potential, an offensive line mixed with veterans and young players, and three key new defensive imports that will hope to change the team’s fortunes on that side of the ball. The Dolphin’s talent ranking is middle of the road, but they rank 7th in the league for roster stability meaning, based on their talent score, they should remain in contention for a playoff spot all year. With the departure of Lamar Miller, it looked like the Dolphins would go with the unproven duo of Jay Ajayi and Kenyan Drake at the RB position. I originally had them labeled both as low investment youth because of how little draft capital is invested in them (5th round pick for Ajayi, 3rd for Drake) and the short shelf life of players at the position. But this week the Fins, perhaps a little worried about how their inexperienced duo would perform carrying the load for a team expected to contend for a playoff spot, signed uber-talented, but often-injured Arian Foster. I moved Foster to the starting position and slotted Ajayi in as the backup. Ajayi’s between the tackles style should complement Foster’s versatility well. Given Foster’s ability and the fact the team’s investment is a one-year deal on a player looking to prove he can stay healthy, I’ve slotted him in as a good veteran. If the deal had been longer-term, I would be more leery about strapping that label on him given his lengthy stints on the sideline. 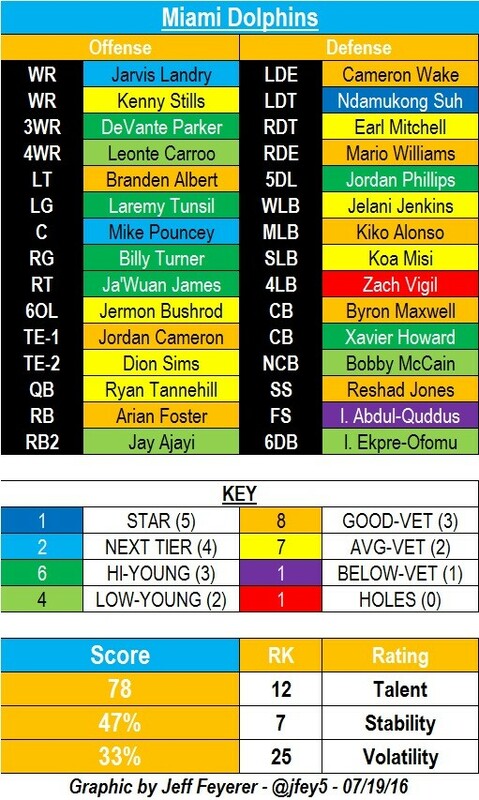 The additional depth, plus the fact Ajayi and Drake are the 2nd and 3rd options as opposed to the 1st and 2nd options should give the Dolphins some piece of mind. If Mario Williams can regain his form as a traditional defensive end in a 4-3 defensive front, the Dolphins front four has the potential to be devastating. Given his subpar performance last season, I dropped him to a good veteran but, at the age of 31, he certainly has the chance to thrust himself back into the elite category, especially alongside Suh and with Wake opposite him. The make or break area for the 2016 Dolphins may be the offensive line. They were 30th in sack percentage during the 2015 season and have 3 of their 5 starters (Laremy Tunsil, Turner, James) labeled as high expectation youth. The realization of those expectations under the tutelage of Gase would allow the Dolphins offense to thrive in the short term and long term. As any NFL observer with a cursory knowledge of my ratings would expect, the Patriots are in the top 5 in both talent and stability. And, like most playoff teams with a long track record of success, there is very little volatility on the roster. Head coach Bill Belichick inserts young players into the lineup judiciously, but he is exceedingly good at finding the right players for his scheme. Tom Brady continues his march to Canton and doesn’t seem to be regressing anytime soon, and the acquisition of Martellus Bennett gives the Patriots the most devastating tight end duo in the league. Other shrewd veteran acquisitions like Terrance Knighton and Chris Long should fit in well; Knighton’s veteran presence will aid in the development of 2015 1st round pick Malcolm Brown, while Long will hopefully replace some of the pass rush that went out the door with Chandler Jones‘s departure to Arizona. Questions remain on the defensive side of the ball – specifically getting after opposing quarterbacks and forcing turnovers, two areas of weakness in 2015 – but the roster is built for another Super Bowl run. The Patriots rarely rely on young talent in large roles, but, based on my projections, their top three cornerbacks will start the year classified as high expectation youth, representing three of only four players at that position. This also brings some context to how players are classified into groupings. Malcolm Butler was an undrafted free agent out of a small college but, based on his installation as the #1 cornerback on a perennial playoff teams, it is safe to say the Patriots have a lot invested in his success. The interior of the Patriots offensive line is littered with fourth-round draft picks backed up by a former top-10 pick acquired in a trade. Tre Jackson, Shaq Mason, and Bryan Stork were all highly regarded players out of college, but interior lineman are not traditionally valued as highly as other positions, dropping them into the low investment category. They are starting in the middle of a line tasked with protecting the Patriots’ signal-caller, but the acquisition of Jonathan Cooper and the interchangeability of those interior positions prevents me from elevating their rating. Jamie Collins and Dont’a Hightower are on the verge of solidifying their status as stars, but there is little depth behind them, even in the way of development prospects. Given both players’ importance and versatility, their health will be integral to New England’s defensive performance. If there’s one team’s rating that made me question the accuracy of my valuation model, it was the New York Jets. 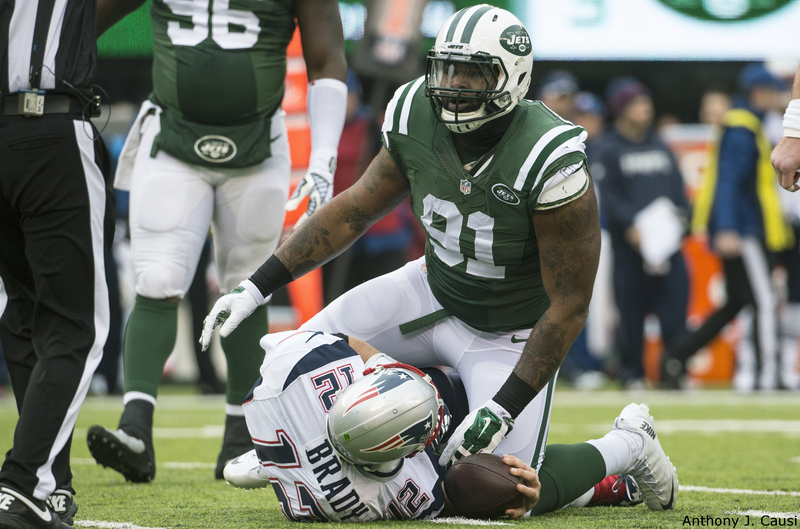 They have four below average veterans slated on the offensive side of their condensed depth chart, but the team score is bolstered by the star power of Muhammad Wilkerson, Sheldon Richardson, Darrelle Revis, and Brandon Marshall. The acquisitions of Matt Forte, Ryan Clady, and Jacques McClendon patched some holes with the presence of solid veterans, while Jarvis Jenkins and Darron Lee brought much needed youth to the linebacker corps through the draft. Whether it’s Geno Smith, Christian Hackenberg, or Ryan Fitzpatrick at quarterback for the Jets, not making mistakes will be the ultimate goal. According to my analysis, there is enough talent around them that simply being steady, not even spectacular, at the position will benefit the Jets. A team ranked 10th in talent and 11th in stability should provide plenty to cheer about in 2016 – but only if they can find the right signal-caller. The suspension of Richardson in 2015 and the one-game suspension for 2016 did alter my rating slightly, but not much. When he’s on the field, he’s one of the best defensive lineman in the league. The bigger problem could be what the line looks like a year from now. Right now, it’s deep and talented, but if Richardson runs into more problems, that could change. The unexpected five-year extension signed last week by Wilkerson provides some reassurance that the Jets line will be good for some time. But with Richardson, it is the best in the game and that doesn’t continue unless he rebounds this season. Dee Milliner has done little to justify his 9th selection in the 2013 Draft, but the lack of depth the Jets have at the position behind Revis and Buster Skrine makes his performance vital. I classified him as a high expectation youth because, despite his poor performance through three seasons, there is still value in his ability to potentially fill their void as the third cornerback. He missed most of 2015 with a torn Achilles’ tendon, but with $2.1 million guaranteed in 2016, the Jets have incentive to give him every opportunity to win the third cornerback job. Given the propensity for passing nowadays, what better time for Milliner to step up and finally reward the Jets for their high initial investment. If their young players develop and avoid injury, the Jets could have a completely revamped linebacker core around veteran David Harris. Lee, Lorenzo Mauldin, and Jenkins provide potential future building blocks the Jets sorely needed at the position. They may not all start opening day, but I am projecting that as the best option for the Jets. Follow Jeff on Twitter @jfey5 and see his explanation for his new player-team evaluation system here.